Bev & Tom Simpson offer their Bunkie this summer to young families who could be prospective members. If you know a young family (i.e. at least one child under age 12) who would make an ideal addition to the Springs, offer them our Bunkie for a weekend or up to six days this summer. Use is rent-free, subject only to a cleaning fee/clean up by them upon departure. Let's get some young families to experience what the Springs is all about and to 'try before they buy'. That will mean the sponsor member will need to take them around to experience the Springs - golf, tennis, beach and events. Our Bunkie was built in 1932 and its restoration recognized in 2002 with a City of Burlington Heritage Award for contributing to the conservation of Burlington’s built heritage. It has a full kitchen, three-piece bathroom, master bedroom with double bed and second bedroom with a bunk bed that sleeps two. A double blow-up mattress is also available. 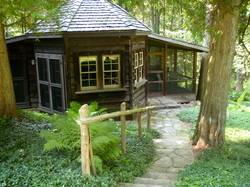 It has a lovely screened-in porch that faces the creek and the woods. Deer are sometimes seen. TV, radio, etc. amenities as well. Check availability of the Bunkie during July or August, 2014. Send an email request now or call 905 336 8318 during the summer.